and Sphere Books, London. 1982. 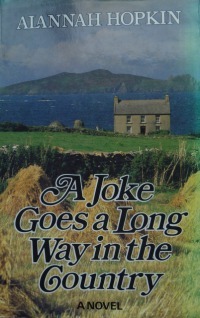 There is a certain librarian in Cork who, every time he sees my name on my ticket, says in a furtive whisper ‘You wrote A Joke Goes a Long Way in the Country!’, and winks, as if, God forbid, I had written a dirty book. ‘It was an idyllic sort of day, her last idyllic day with Tom. As usual they had one drink in all four bars in the tiny village of Allihies, with Tom’s old excuse that to leave any of them out might cause offence.